Australia´s KTM Bike-talent, Dakar Rally winner 2016 and third in this year and his first Dakar in 2015 Toby Price will start for his Australian partner Mitsubishi and Team Triton in the Australien "SuperUte" (Super-Pickups) series with a Mitsubishi Triton (L200 Pickup) at the Adelaide 500 race on March 1-4. Price is Ambassador for Mitsubishi in Australia since 2015, just tested the Peugeot 3008DKR for PH Sport (we reported) and is starting now his first race with a car. Price said pre-season testing gave him the perfect opportunity to preview the new track-tuned Triton and get a taste of the inaugural SuperUte Series. 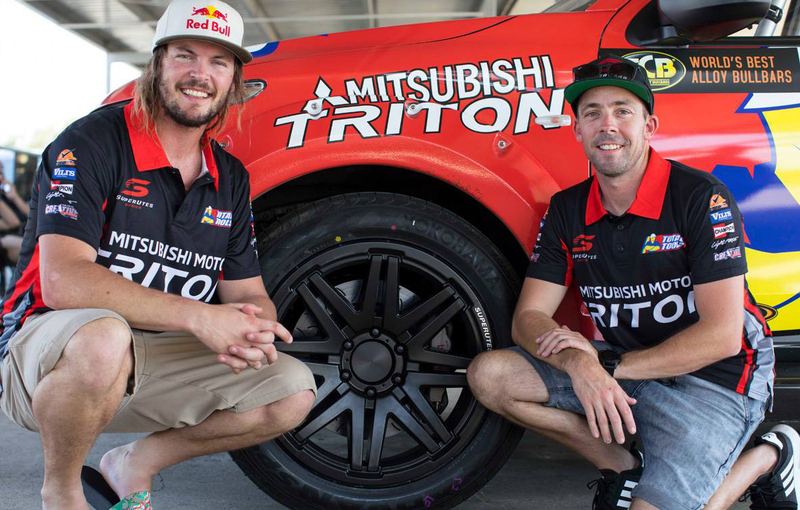 "I'm stoked to be a part of the Team Triton SuperUte campaign with the support of Mitsubishi Motors Australia," he said. "I'm really looking forward to putting in the work, learning more about circuit racing and having some exciting weekends. It's going to be a good time and I'm aiming to keep it on four wheels and get some good results." Price will be competing in all SuperUte events that are non-conflicting with his Rally priorities, and for the events he is unable to complete in Team Triton is looking to fill the seat with another talented driver. Team Triton is operating with the backing of Mitsubishi Motors Australia and Sieders Racing, with Mitsubishi supplying Triton utes and parts in a 2 year deal. "Motorsport has played a central role in Mitsubishi’s heritage and vehicle development so we embraced the opportunity to partner with Sieders Racing in the 2018 SuperUte Series," said Mitsubishi Australia’s Deputy Director of Sales, Tim Hore.